It has 2 DNS records, dns4.snhdns.com, and dns3.snhdns.com. Totalchoice Hosting Llc (Michigan, Troy) is the location of the Apache/2 server. 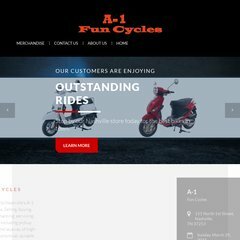 A1funcycles.net's server IP number is 208.76.82.63. PING (208.76.82.63) 56(84) bytes of data. A ping speed test response, is timed at 17.5 ms.